Testimonials. What users tell about Compare PDF. Testimonials. What users tell about Compare PDF? All feedbacks published here were submitted by users of Compare PDF. You are welcome to share your option too, please use support form. Thank you! I'm an analyst/programmer for the IS department of Xstrata Copper/CCR. Our goal is to be able to generate a PDF report containing the necessary steps required for the equipment maintenance. In order to have these procedures available to all personnel, a PDF file is generated for all equipment's. Whenever there is a change in the maintenance procedure of any equipment, a new PDF file is generated to replace the old one that was generated previously. Afterwards, an email is sent to the managers with the old PDF file and the new one. The managers then verify that the changes made to the procedures are correct. Rather than examining character by character each lines of both files, they use Compare PDF to see a report indicating the changes that were made. Compare PDF software is generating these reports in a command line mode. Some new documents are delivered from Sweden branch of our company with change in the content but without history description. I need to know what is new or what has been corrected in the latest version. I am a systems consultant, Compare PDF is for use in regression testing sales illustration system output - great tool, now fully integrated into the testing process. Compare PDF task is simple - to verify that our different versions of our software generate the same results. Simple and in-expensive solution for this task. Thomas, Marietta, GA I'm using your software for personal needs, to organize duplicate archives in my personal computer. Nice tool. Inexpensive and easy to use. Using it to compare PDF files for financial statements. Alexandre, Teddington Our legist must compare investments contracts in the pdf format. We needed only the product that can compare PDF. I'm a quality assurance tester for my firm and I have been searching for some basic comparison utilities for text files, pdfs, directories, file compares etc. Adrian We develop our Operator/Customer manuals in FrameMaker and a PDF is created and viewable by many users using Acrobat Reader. Compare PDF tool provides an easy way for someone to compare two versions of the manuals. "I was faced with the daunting task of comparing two large documents, provided to me only in PDF format, with over 130 pages each. I had hoped to use Adobe Acrobat ("standard", not the free reader) to do the comparison, but I recently upgraded from version 5 to version 7 and found that it no longer supports PDF compares. I have been told that I now need an additional expensive upgrade to Acrobat "professional". At this point I was a bit upset at Adobe, so I searched the internet for an alternative, and found PDF Compare. You offered a free 30-day trial, so I tried it. Within minutes it was obvious that it did a good job of comparing the PDFs. I guess that I could have kept the report file and not purchased the software, but I have a personal policy that if I get value out of a trial/demo, then I buy it. It keeps encouraging innovation. Great software, very reasonable price". My position is test manager and I am using your software for comparing test results. Sam We are using Compare PDF to compare baseline in PDF and Excel documents to revised documents to determine level-of-effort to update XML database. Also, using it to determine, to compare structured XML such as that written to a schema to determine changes that may have been made within the files. I'm a System Analyst in Devonex. We are using Compare PDF to compare a bunch of reports which was generated in PDF format. Bernard, Nottingham, UK Using it for compare PDF files for regression testing of corporative applications that manage the international operations. I use it for comparing of newer with old pdf files. Prospects, fliers, etc. Mark, New Hope, PA I'm Senior Software Engineer, I'm using Compare PDF to find the difference in the manual. I am a senior associate with a law firm and intend to use the software to compare PDF files that we are increasingly using. "Really finding the program useful as we need to compare Excel spread sheets." 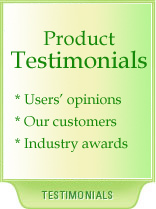 "I am happy to be able to list your software at Softpicks Network. It really is a valued contribution that I and the rest of my team sincerely appreciate. Thank you very much for this opportunity. We have checked your software twice and it is great ! So here is your award of 5 stars!" ".. As I'm Document Officer within my company I needed not only plain text comparison by comparison for Microsoft based products (ms word i mean). That what Compare Suite do for me best. Reports function is another nice surprise, especially one for folders comparison". “... I felt very happy about the comparison process.. its simple and quite worth. It just made me sit relaxed for a while when I had to compare 2 sites..."
"I am working as Software Engineer and using your Compare PDF to compare specification PDF generated for my managing work". "I am a tax programmer and I compare state tax instructions from one year to the next using pdf compare software Compare PDF". Sign up for the free Compare PDF email newsletter. Enter your email address below, and then click the Subscribe button. Your email address will be kept confidential, and we will use it only to send you our newsletter.